TITAN File is a high-density platform tailored for mass content production workflow. As hardware companion of widely deployed KFE2 solution, TITAN File can transcode any mezzanine files into high bandwidth efficient files compliant with the multi-screen Industry Standards. Encode: HEVC, H264, MPEG-2, and Apple ProRes1. Resolution: Mobile to UHD, 4K HDR. Premium audio with loudness correction. Closed captioning, DVB subtitle, teletext. Standalone server to enterprise farm and cloud. Easy to use web user interface and REST API. 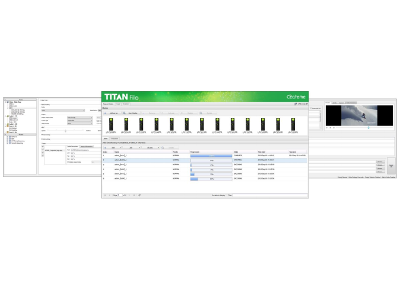 TITAN File is a carrier-grade software-based video transcoding solution dedicated to multi-screen delivery. Leveraging the ATEME’s codec expertise and based on ATEME 5th Generation STREAM© compression engine, the TITAN delivers the highest video quality at minimum bitrates with accelerated parallel processing. TITAN File delivers various types of content to TV/Mobile/PC over managed or non-managed networks in the fastest turnaround. Any kind of mezzanine file can be simultaneously transcoded into multiple flavors such as MPEG-2 TS for VOD/push-VOD services, or Apple’s HTTP Live Streaming and Microsoft’s Smooth Streaming for OTT delivery. TITAN File includes up to 18 blades with the latest Intel®’s chipset generation and an optimized hardware architecture lowering power consumption. Thus, TITAN File can be entitled as green technology solution saving energy and reducing OPEX. TITAN File features high scalability and flexibility which makes it a solution compatible with any future requirements of the content delivery market.